Une Affaire d’Hommes – A Man’s affair – is the writing on the flooded tavern. 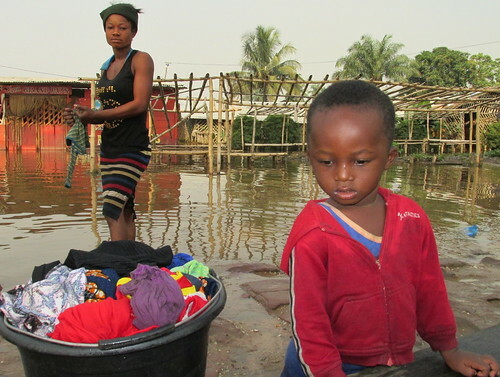 Historical data is limited, but it appears that Congo River’s annual high water season at Kisangani results in major inundations every 15 to 18 years. Large parts of the city are flooded. Dugouts ply the flooded streets. 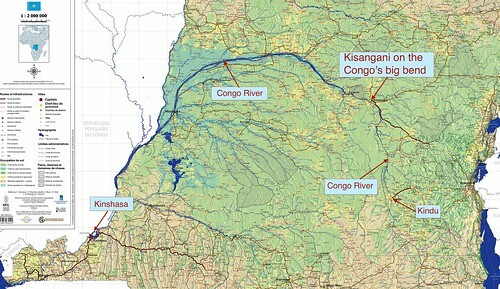 Kisangani’s location on the equator, at the bend in the Congo River, makes it vulnerable to catastrophic floods when high rainfall coincides over both the northern and southern tributaries of the Congo River’s eastern basins. In these high rainfall years, flood waters mount through October and into November at the end of the northern rainy season. The water crests in late December as rains peak south of the equator. Kisangani gets first the high rains from the north, then from the south. 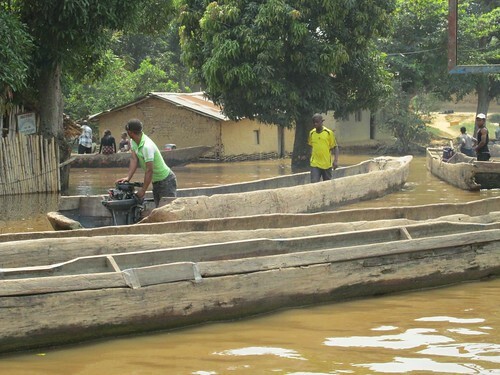 Exceptional floods were recorded in Kisangani in 1962 and again in 1979. The 1997 floods were particularly bad. High water crested in late December at the highest levels in 35 years. Over 70 people were reported drowned or swept off by the river and tens of thousands left homeless. 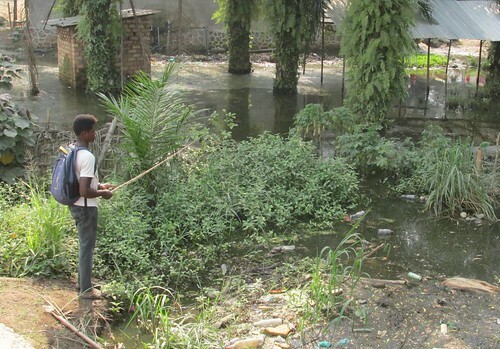 More than 1200 cases of cholera were reported over the New Year, with hundreds of deaths. Flooding coincided with other challenges to the city and its population. Fighting between the forces of ex-dictator, Mobutu, and the advancing rebels loyal to Laurent Kabila had devastated the city earlier in the year leaving the city ill prepared for the natural disaster and thus contributing to the heightened death toll. 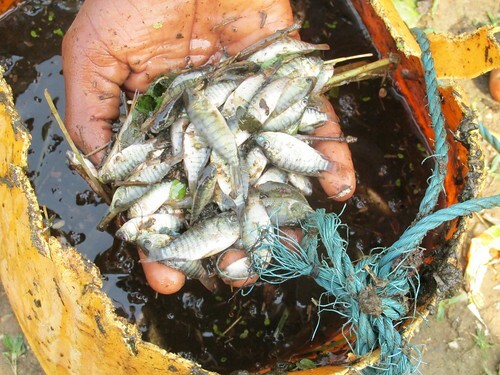 Many fish are in the receding waters made nutrient rich by flooded outhouses (background) and other waste. The city flooded again in 2003, but the waters did not reach 1997 levels. 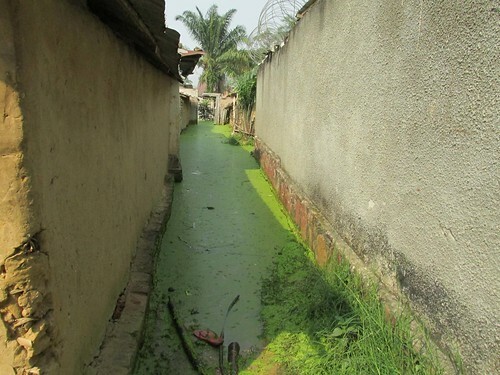 In residential areas with septic tanks many filled and overflowed contributing to the disease threat. This year, 2015, flood waters returned, with levels reportedly higher than in 2003, but not approaching the 1997 records. In November and December heavy rains fell over Congo’s southern basins, including the TL2, but the worst was avoided thanks to an early onset of the dry season in the north with water level of the northern tributaries dropping before the heavy southern rains. So far, we have heard of no deaths from drowning or confirmation of death from Cholera. Most houses had no second floor for shelter from the flood. 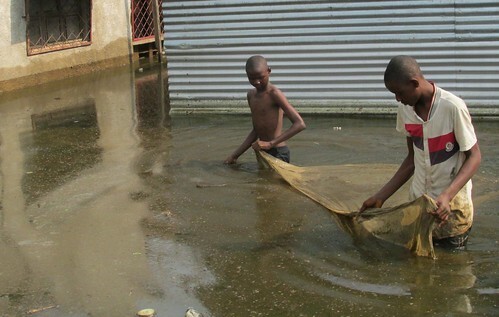 Boys fish by drawing a mosquito net through the flooded streets…. ….the catch seined from the city’s flood-waters. No longer necessary to walk to the river to wash the clothes. Life as usual…the river people bounce back quickly. 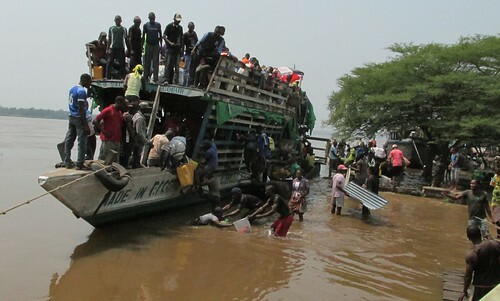 Here, the dugout ferries cross the Congo right up into the Lubunga streets. 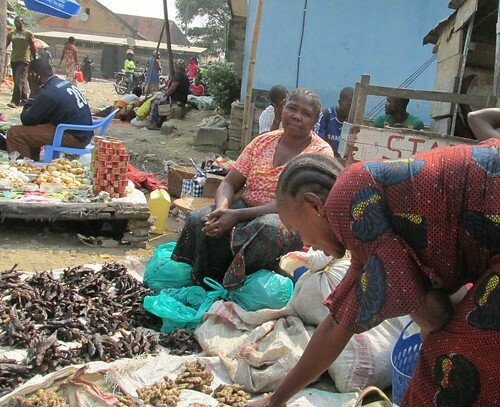 Life as usual: the market vendors found spots of dry ground and the bargaining continues. Life as usual: In a flooded port, yet more cargo being added to a precariously overloaded riverboat. 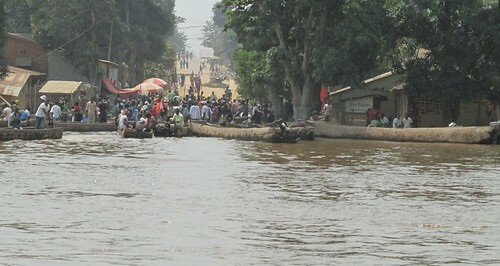 Kisangani will flood again. And new patterns may emerge as global climates change. The city will require, along with dykes, basic information on the regional rainfall patterns, information that is not now in hand. 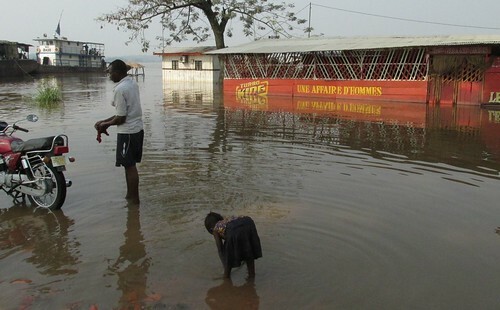 Collection of meteorological data, and notably rainfall for Central Africa, was considered important several decades ago, but now has plunged to levels similar to the early 20th century. Operational rain gauges per year in Central Africa. Published in Congo Basin rainfall climatology: Can we believe the climate models? At the recently concluded Climate Change Conference, COP 21, in Paris, the least-developed nations called on developed countries to help their poorer neighbors to adapt to climate disasters. Priorities include, among other things, early drought warnings for farmers and development of dykes or other measures to protect sensitive environments during torrential rains. 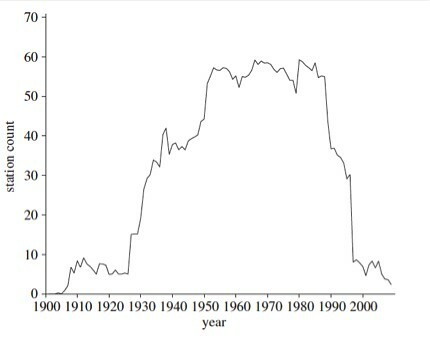 It is questionable, however, what can be done with the collapse of record keeping in Central Africa; the case from DRCongo, with more than 50% of the Congo Basin, is the most dire. Central African precipitation recording stations. World Meteorological Organization, World Weather Watch Regional Basic Climatological Network. A congolese, Tosi Mpanu Mpanu, leads the COP 21 movement of the least-developed nations. Tosi could do worse than to start with a commitment by his own country to reestablish credible meteorological record keeping. Thanks to John Hart for this post and thanks to Michel Mopanga for the photos. This entry was written by Terese Hart, posted on 2015-12-21 at 8:04 pm, filed under Kisangani. Bookmark the permalink. Follow any comments here with the RSS feed for this post. Trackbacks are closed, but you can post a comment. Très intéressé par les activités de TL2. 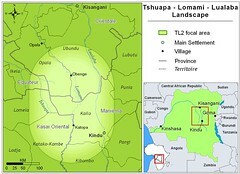 Je suis licencié en gestion de l’Environnement et assainissement de l’Institut Facultaire de Développement de Kinshasa et avoir mené mes recherches sur le Parc de la Lomami. J’avais exprimé le désir d’entrer en contact personnellement avec Mme Thérese et Mr Hart.